SAN DIEGO - Ships and units from the Sterett-Dewey Surface Action Group (Sterett-Dewey SAG) will depart San Diego for a regularly-scheduled deployment to the Western Pacific, March 31. The command staff of Destroyer Squadron (DESRON) 31 and the guided-missile destroyers USS Sterett (DDG 104) and USS Dewey (DDG 105) will deploy with the embarked helicopter detachments from Helicopter Maritime Squadron (HSM) 49 and HSM 78. The Sterett-Dewey SAG will operate with regional navies to conduct routine patrols, maritime security operations and theater security cooperation activities to enhance regional security and stability. 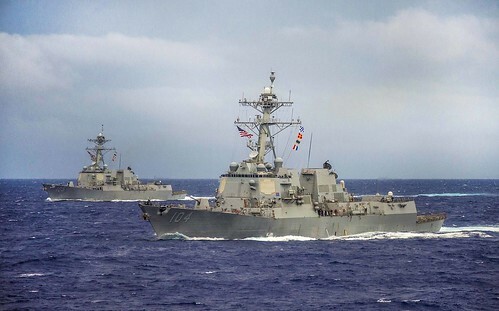 As established during the three-ship Pacific Surface Action Group deployment in 2016, Sterett-Dewey SAG will remain under Third Fleet control, including beyond the international dateline which previously divided operational areas of responsibility for 3rd and 7th fleets, for the entirety of the deployment. Third Fleet operating forward offers additional options to the Pacific Fleet commander by leveraging the capabilities of 3rd and 7th Fleets. This operational concept allows both numbered fleets to complement one another and provide the foundation of stability in the Indo-Asia-Pacific region. "We are building upon the successes and applying the lessons learned from the inaugural PACSAG deployment," said Capt. David A. Bretz, commander, DESRON 31. "The value of a SAG cannot be overstated. We are ready and able to support a variety of exercises and missions with our partners and allies in support of maritime stability and security in the Western Pacific." U.S. Third Fleet leads naval forces in the Pacific and provides the realistic, relevant training necessary for an effective global Navy. Third Fleet constantly coordinates with U.S. 7th Fleet to plan and execute missions based on their complementary strengths to promote ongoing peace, security, and stability throughout the entire Pacific theater of operations.